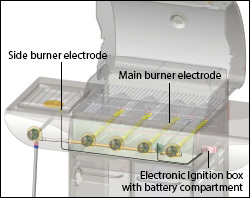 Check to ensure that all Electrode(s) spark when the igniter button is pressed. Check for un-plugged electrode wires or ground wire. Check for damage to Electronic Igniter Box. 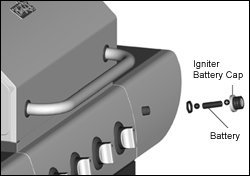 When the ignition button is pressed, a rapid clicking sound accompanied by a spark should be visible at all electrodes. If a spark is not visible, check the electrode connection to the Electronic ignition box. Locate the Electronic Ignition box on the back of the control panel. Check all wire connections. 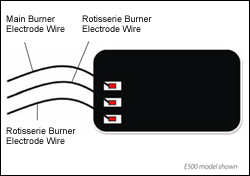 Disconnect the corresponding electrode wire and reconnect by pushing the wire in tightly at the connection point. If the electrode still does not spark, but a spark and sound can be heard at the other Ignition points, replace the faulty electrode wire. 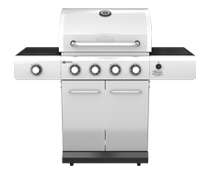 Note: All main burner, side burner and rotisserie burner connection points are the same. Positive connection has not been made between the tank and the regulator. Flow limiting device has been activated. See Resetting Flow Limiting Device below. 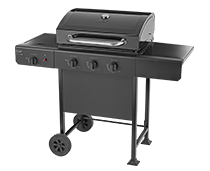 NATURAL GAS MODELS: Installation issues related to incorrect size supply line installed and/or water column supply is not adequate for a barbecue BTU rating of this grill. Do not use a longer natural gas hose than is supplied with your grill. Pre-heat with the lid closed for 15 minutes. In colder temperatures preheat for longer periods. Gas pressure is affected by the length and piping size of the gas line from the home. Follow the recommendations in the chart below. See natural gas hook-ups and warnings. 51-100' 2/3" of run 3/4" or 1/3" of run 1/2"
The interior lid is Aluminum not painted. Baked on grease build-up has turned to carbon and is flaking off. Clean thoroughly. Your BBQ's Gas supply hose and regulator contains a thermal element that will shut off the flow of gas between 240°F and 300°F, by melting the supply hose and essentially disconnecting from the LP cylinder. Poor ventilation caused by in-appropiate clearance at the sides and rear of the BBQ. Overheating caused by high cooking temperatures and grease build-up. With the BBQ lid still OPEN, reconnect the hose and regulator to the propane tank- Do not cross thread the connection. Hand-tighten only. Check all hose connections to ensure that a positive seal has been made. Slowly turn ON the propane gas supply, ¼ to ½ a turn. Wait approximately 5 seconds for the hose and regulator pressure to stabilize before lighting (to prevent the flow limiting device feature from being re-activated). Always observe safe food handling and safe food preparation practices when using this Barbecue, to prevent food-borne illnesses. Sanitize counters, equipment and utensils after handling raw meat, seafood or poultry. Rinse with a dilute chlorine bleach solution, one teaspoon to a quart of water. Avoid cross-contamination in preparing food. Always use a meat thermometer to confirm that foods have been fully cooked. Always use separate plates and utensils for the handling of raw food. Never place raw food and cooked food on the same plate, and never place cooked food on a plate that was used for handling raw food. Always carefully wash all plates and utensils used to handle raw food before using them to handle cooked food. Always wash all vegetables, seafood and poultry before cooking. Always marinate meat in the refrigerator. Always dispose of the excess marinade, and never reuse it. Always preheat your Barbecue for 5 to 10 minutes before cooking, and clean all grease and food residue before using the cooking grates. A few helpful hints will ensure that your grilling results are perfect every time! Always preheat the appliance on HIGH before adding food. To reduce flare up's cook lean cuts of meat, trim excess fat and avoid cooking over very high temperatures. Always ensure that the temperature is adjusted following preheat. HIGH is intended for fast pre-heating of the appliance, searing steaks and other cuts of meat. Turn foods infrequently. Turn food only once, halfway through cooking time. Do not place frozen meats on the cooking grates as this will permanently damage the cooking surface. Always cook with lid down to preserve BARBECUE temperature. Trim excess fat from meats and slit the remaining fat at two-inch increments to avoid flare-ups and curling. Fatty meats may be cooked indirectly on lower heat settings. Apply salt only after cooking to prevent drying out the meat. Direct Cooking — This is the most popular cooking method and involves cooking food directly over the flame, such as searing a steak. Indirect Cooking — Food is placed on the cooking grates, offset from the heat source. With the barbecue lid closed reflected heat surrounds the food cooking it more evenly and gently. This method is perfect for roasts, but is also useful whenever you want to slow cook or bake a wide variety of foods. The barbecue lid should always be closed when using the indirect cooking method. HI — Use to pre-heat barbecue and for quick searing of meats and vegetables. MED — Barbecue steaks, pork chops and hamburgers. You may also sear meats on medium and cook them on low. LOW — Used for cooking dense vegetables, roasts, thick cut of meat, poultry and fish. For best results preheat your side burner for 10-15 minutes on "HI"
Your side burner will take longer to preheat and cook than your indoor range. Remove all food residue and dirt on side burner surface. Inspect and clean your side burner orifice periodically and confirm that it is clear of food residue, cobwebs or other insect debris that may cause a FLASH BACK FIRE. Your Infrared Zone side burner is a powerful Infrared burner that will allow the chef to grill like a professional. Infrared burners offer the perfect searing power with the most intense heat delivered directly to your foods. How is this different from your conventional BBQ burners? Unlike conventional burners, Infrared heat is not lost to the surrounding air and will offer more efficient and effective cooking heat. When not in use as a sear burner, use this space as a traditional side burner by simply adjusting the Infrared Zone control knob to a lower setting that suits your needs. Reverse the Infrared Zone cooking grate for all foods requiring a pot, wok or frying pan. Remove and clean the Infrared Zone's grease collection tray to avoid spilling grease on your deck or patio and to avoid a potential grease fire. 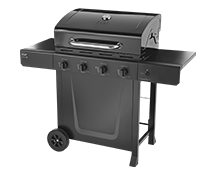 This 8,500 BTU/hr Stainless Steel Rear Rotisserie Burner is the perfect tool for cooking chicken wings, ribs, lamb leg, and small roasts. Cook over indirect heat with plenty of moisture. Use a drip pan big enough to fit under the entire rotating entree. Keep basting fluid in the drip pan at all times. Never allow a rotisserie drip pan to dry out while cooking. Grease dripping into a hot drip pan can easily ignite and damage the pan while ruining your meal. Always use a meat temperature probe to ensure proper internal meat temperatures and doneness. Perform a Leak Test every time you change your gas tank, when your barbecue has not been used for a period of time, or if you notice a dramatic change in your barbecues performance. 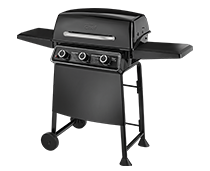 Turn all grill control knobs to "OFF". Ensure that the regulator is tightly connected to LP cylinder. Completely open LP cylinder valve by turning hand wheel counterclockwise. If you hear a rushing sound, turn gas off immediately. There is a leak at the connection. Correct before proceeding. Brush soapy solution onto hose and regulator and all connections from the LP tank to the main and side burner manifold. If "growing" bubbles appear, there is a leak. Close LP cylinder valve immediately and re-tighten connections. If leaks cannot be stopped do not try to repair. Call the Customer Care Hotline for replacement parts. Always close LP cylinder valve after performing leak test by turning hand wheel clockwise. 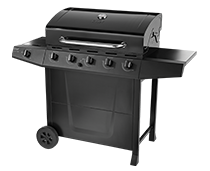 May cause charring on the interior of BBQ lid, lid side panels (inside and outside), may damage temperature gauge, cause brownish colouring on stainless steel lids and soot and ash build up on cooking grates. 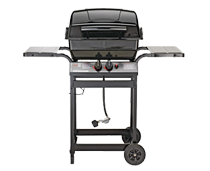 Removing grease build-up on key parts such as flame tamers, cooking grates, and burner box. Always reducing cooking temperature to "MED" or "LOW" heat, following PREHEAT. Spiders and insects are attracted to the smell of propane and natural gas, and often build nests inside your BBQ's burners, which is the root cause of a FLASH BACK FIRE. Lighting your burners without first checking and cleaning out the Venturi tubes, burner ports, and the inside of burners can lead to a serious flash back fire resulting in damage to the BBQ, property and/ or personal injury. Cleaning and maintaining your barbecue ensures your families safety, optimal parts performance, and a long life for your barbecue. Perform at the start of the season, and at least twice in-season, more if the barbecue is being used frequently or year-round. Simply brush off all loose particles with a brass brush before you start grilling. To prevent future build-up, wipe lid with paper towels or a mild soap-and-water solution after every grilling session. Do this while the grill lid is warm – not hot! For heavily soiled lids that require more effort, remove all interior parts, and spray the interior lid and burner box with a BBQ degreaser. Allow the degreaser to penetrate the build-up. This may take approximately 10 minutes. Depending on the build up, you may need to spray the interior a second time and wait. Using a grill brush, crumpled aluminum foil, or a paint scraper- scrub away the build-up. Do not use steel wool or harsh chemical cleaners that may leave a toxic residue on the interior of your BBQ. Lay a piece of aluminum foil across the entire cooking surface with the shiny side up. Light the BBQ and preheat on high. Close the lid. Essentially creating a high heat self cleaning environment. After 15 minutes- shut down the grill. Using a grilling glove- remove aluminum foil and crumple up in a ball. Use the aluminum foil, a long handled brush or plastic paint scraper to scrub the interior of the lid, and remove the build-up. After removing most of the build-up, clean the interior of the burner box and lid with dish-soap and flush with water. Once clean, inspect all interior parts. If there are any signs of corrosion you can touch-up with Black BBQ paint, found in your local hardware stores paint aisle. Also, lightly spray the interior burner box with cooking spray to protect. This should only be done when all parts are removed for cleaning. Use a grill brush to remove surface debris. Clean the burner port holes using a wire or paperclip to unclog the ports. Be careful not to damage or enlarge the port holes. Using a flexible Venturi cleaning brush, clean the interior of the burner. Shake any loose debris out of the burner, through the gas inlet. Using a cotton swab, remove debris from the valve gas jets. Re-install the burner. Ensure that the burner is properly seated over the valve gas jet. Remove and clean heat distribution plates every other time you BBQ. If you are cooking for a large number of people, cleaning should occur immediately following cool down. Use a grill brush to brush away any buildup from your heat distribution plates. Clean away all remaining debris with mild soap and warm water. Seasoning cooking grates improves cooking performance, prevents damage and deterioration due to moisture and humidity, creates a non-stick surface for cooking, and extends the life of your cooking grates. Wash the cooking grates with a mild soap and water solution. Rinse thoroughly, and dry with paper towels, or shop towels. Important: Never soak or let soapy water sit on the grates for any length of time. Ensure grates are dried thoroughly. Coat entire grate, front and back, sides and each rod with vegetable shortening. DO NOT use salted fat such as margarine, butter or any non-stick cooking spray. Place grates in either your conventional oven or BBQ for 15-20 minutes at 275-300 °F to complete the seasoning process. Once completed, the cooking grates must be allowed to cool down. By seasoning your cooking grates several times in a season, the pores are permeated with oil, which will prevent water from penetrating the grates and causing early degradation of this part. Stainless steel cooking grates are durable, provide excellent heat retention and offer trouble free maintenance. Before starting to preheat the barbecue, remove all build up from cooking grates using a barbecue grill brush. To create a non-stick surface, prep cooking grates with a light coating of vegetable shortening or vegetable oil prior to adding food to the grill. Under extreme heat, stainless steel cooking grates will become discolored with an orange/ brown colouring, at first use. This is a natural occurrence and does not in any way affect the composite, nor does it affect cooking performance. ALL MATERIALS including stainless steel and black or silver painted parts can become stained, soiled and corroded by dirt, pollution, deposits from inappropriate cleaners and especially grease. To protect the appearance and integrity of the surface, routine cleaning is essential. Contaminants vary greatly in their effect on appearance, corrosivity and ease of removal. It may be necessary to identify the contaminant or experiment with various cleaners in order to resolve issues including the removal of free-iron contamination. Warm water and Mild soap solution to remove all contaminants. Do remove dirt and contamination immediately to avoid permanent damage to stainless steel or painted surfaces, due to rust and corrosion. Do thoroughly RINSE OFF ALL CLEANERS, with clean warm water and DRY COMPLETELY with a soft cloth. Do not use any chloride-containing detergents. Do not use ordinary carbon steel brushes, steel wool or scouring pads as they may leave particles embedded on the surface which can lead to rust. Do not use bleach or cleaners containing bleach. If accidental contact occurs wash immediately with baking soda and rinse thoroughly. Perform cleaning and maintenance of parts as outlined above. Remove all parts such as burners, flame tamers, and cooking grates that can deteriorate as a result of moisture damage. 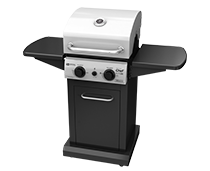 If storing the BBQ indoors: the propane cylinder MUST be removed and stored outdoors, in a well-ventilated area. When storing your grill in a garage, you should place a piece of cardboard underneath your grill to protect from concrete moisture damage. 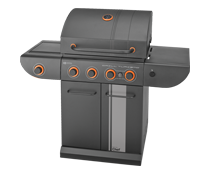 If storing the BBQ outdoors: the propane cylinder valve must be turned off. Cover the barbecue. DO NOT under any circumstances store the propane cylinder in the garage or near any heat source. Use a grill cover to help protect your grill from the direct environment (i.e. rain, snow, animal droppings, etc.). However, please keep in mind that this does not completely protect your grill from moisture.